With the upcoming celebration of the 1st anniversary of GWC's relocation into our new building, we decided it would be a nice gesture to order a luncheon for the office from the new restaurant. Even better, when we called them, we discovered they catered and were more than happy to deliver. The owner visited a few days before the event to scope out the logistics and seemed genuinely excited about being part of the fun. On the appointed day, he and his manager arrived on time, set up the trays and served us a delicious meal. Unfortunately, as the event wound down, things went awry. As is often the case, we had over-estimated our needs and there was a lot of food left over. And when nobody was looking, the caterer began packing up the food in his truck. Kim caught them and demanded that, since we'd paid for the food, they should leave it so our employees could take it home. He sheepishly agreed and brought back one tray before heading back to his truck and hitting the road with the rest of our food. Needless to say, despite amazing service in delivering the product and wonderful tasting food, we will not be using them again. And if each of the 60 or so people in our office tells 10 other people about this, it's likely that the new restaurant just lost a substantial amount of future business. The lesson: Customers generally start out wanting to do business with you. They want to like you and may even be predisposed to help you out. However, you can destroy that goodwill in an instant if you do something stupid to destroy a customer relationship, even if it's after you've delivered the product. "If the Ramones had never existed and came out right now, we would still blow people away. 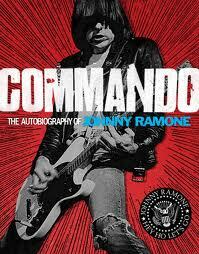 The Ramones were never supplanted by anyone." I thought of this quote when I heard the young man seated next to me at the Penguins game last week singing along with me and a number of other people at the game as "I Wanna Be Sedated" blasted through the arena loudspeakers. Johnny Ramone loved the idea of his punk rock band being played at sporting events. The Ramones exemplified authenticity: They really WERE four working class kids from Queens/Long Island who put on leather jackets, to the subway down to CBGB's in the Bowery and played 2-minute power punk songs for about 20 years. Like most pioneers, they were under-appreciated in their lifetime, but the Ramones' musical legacy has only bloomed since they split up in the mid-90's. Unfortunately, three of the four founding members have since died young, which makes Johnny Ramone's autobiography (which came out last month, 7-1/2 years after his death in 2004) such an unexpected thrill to read. It's definitely Johnny in his own stream of consciousness words; no fancy prose or apologies, just a firsthand account of a fascinating life on the inside of an amazing, sometimes misunderstood, band of societal misfits. I had to smile when I read this line, written by the outwardly dour Johnny: "People would think I was unfriendly, but I wasn't. I just didn't like the people I was around."